“I just can’t give up cheese!” If only I had a dime for every time I’ve heard that excuse for not choosing a plant-based diet. Cheese is crack. If you eat it, you’re addicted. It clogs your arteries, raises your cholesterol and makes you fat. And if you think it wreaks havoc on your body, think about what happens to the poor cows. Cheese is cruel. But lucky for us and the cows, there are some GREAT alternatives! You can give up cheese. Really! Why not start with Parmesan? This vegan “Parmesan” tastes so much like the real thing, you’ll never miss sprinkling Parmesan on your pasta again. And it’s super easy to make. 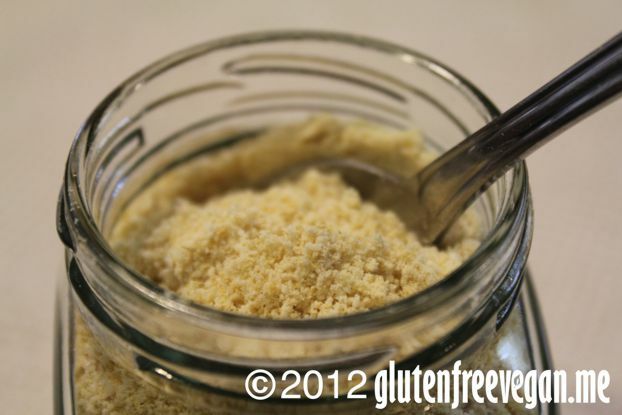 Combine all ingredients into a food processor with bottom blade and blend until the consistency resembles Parmesan. Store in cool place. I prefer to store in a glass jar. Sprinkle on pasta, pizza, veggies, baked potatoes…. and ENJOY! This entry was posted in Recipes and tagged cashew cheese, dairy-free cheese, dairy-free Parmesan, faux cheese, gluten-free, gluten-free vegan recipe, glutenfreevegan.me, glutenfreeveganme.com, italian recipes, non-dairy cheese, non-dairy Parmesan, Parmesan, raw, raw vegan, Vegan Cheese, vegan cooking, vegan recipes. Bookmark the permalink. This I will surely try. Not that I miss cheese, not at all. But it does sounds yummy.